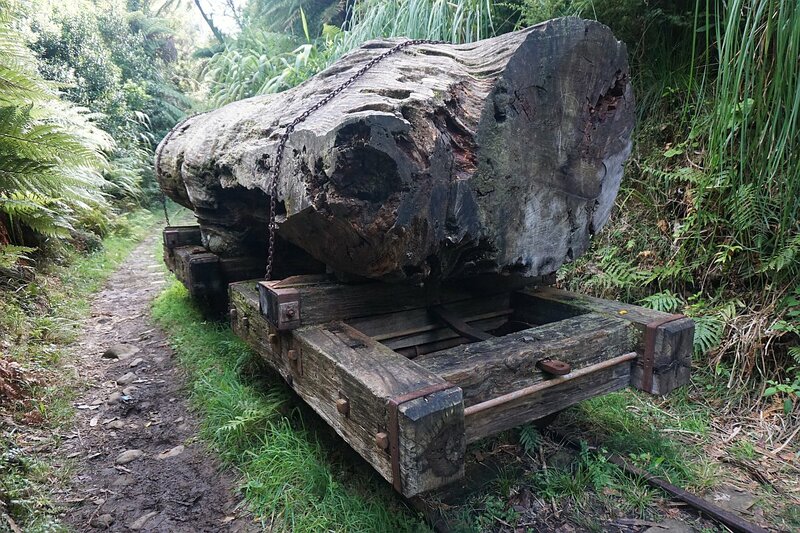 The Waitawheta Tramway Track follows a tramline used in the early 20th century to extract wood from the Waitawheta Valley, first for gold mining operations, and then Kauri logs and timber. 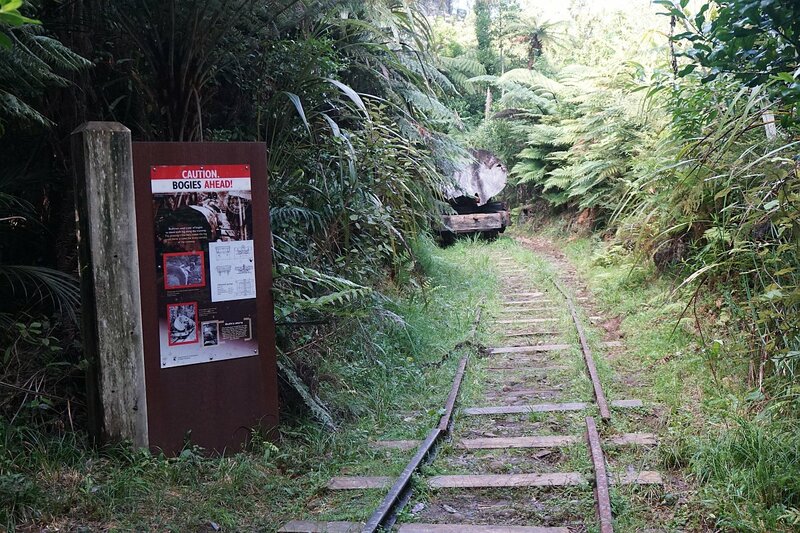 The tramway runs for almost 10 km from Franklin Rd (off Waitawheta Rd) to a sawmill site and the Waitawheta Hut. 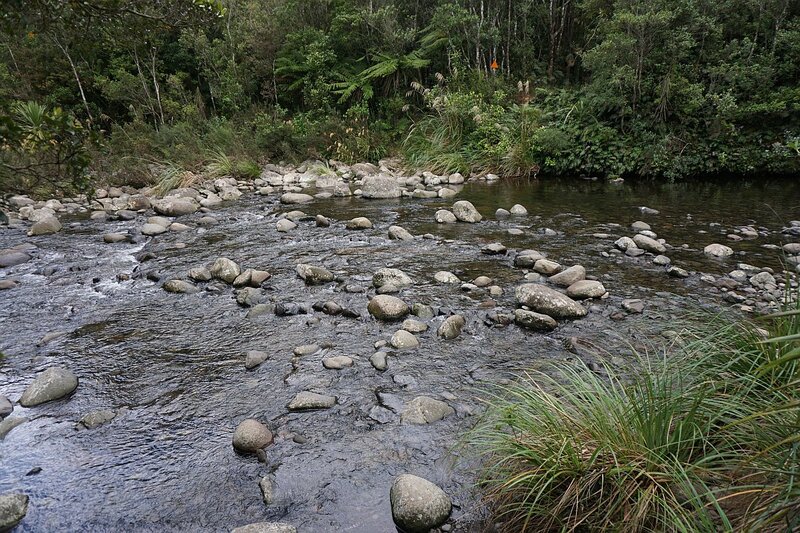 There are 8 crossings of the Waitawheta River, with all except one of them now spanned by bridges. There is a detour track available which bypasses the unbridged crossing. 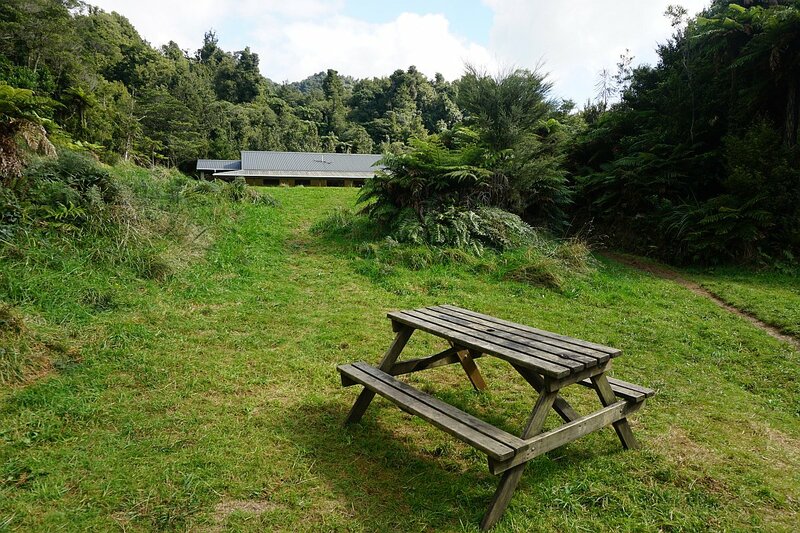 The tramway has a gentle slope, rising from about 160 m above sea level at Franklin Rd, to about 380 m at the Waitawheta Hut. Most of the track is easy to walk, with only a few short washed out sections. Several remains from the tramway and milling can be seen along the way. 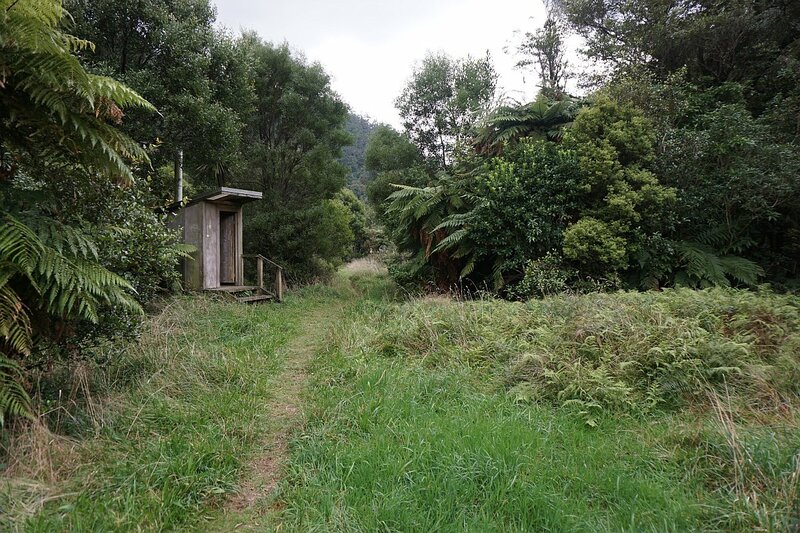 There are no toilet or other facilities at the carpark on Franklin Rd, but there is a basic toilet at the river crossing site, and also at the Waitawheta Hut. More information about the walk can be found on the DoC web site. 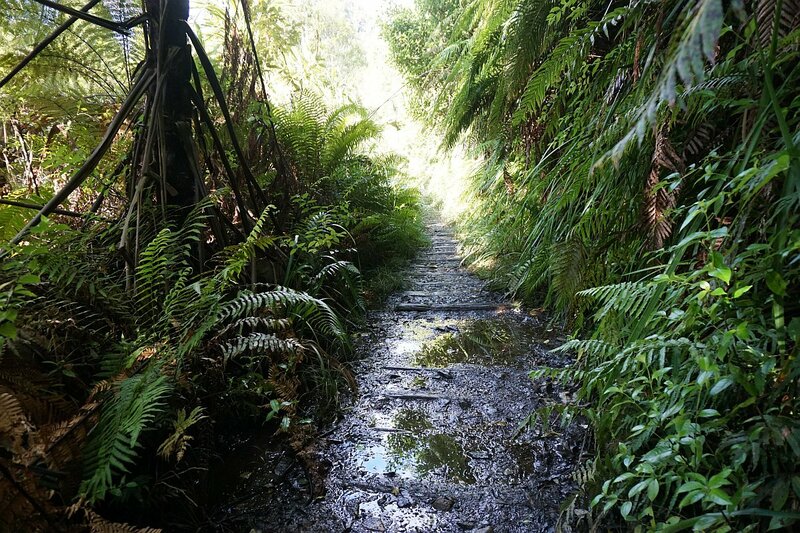 The first part of the walk from Franklin Rd is also shared with the Bluff Stream Kauri Loop track and the Dalys Clearing Loop walk. 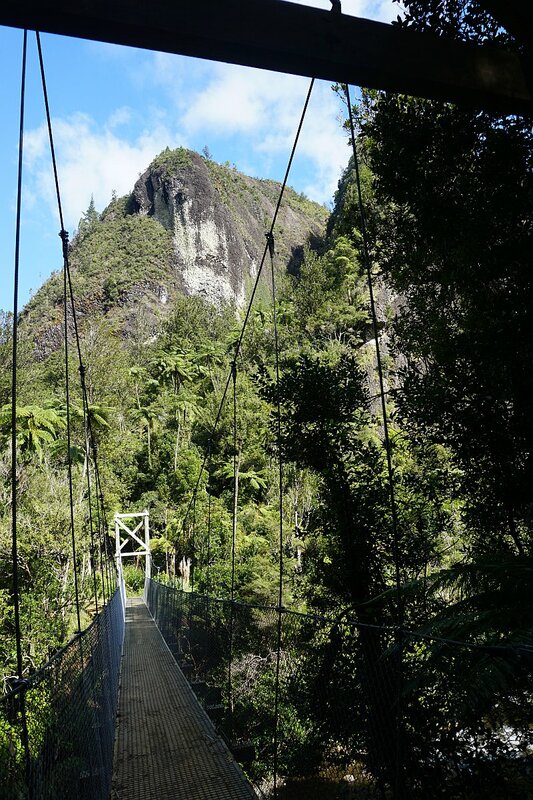 This walk was done using the river crossing bypass track on the way to the hut, and the river crossing track and a short pylon view track on the return to Franklin Rd. Total distance was almost 20 km, with a total time of 5 hours 30 minutes, including 45 minutes for a lunch break and an afternoon break on the return walk. The carpark area at the southern end of Franklin Rd. 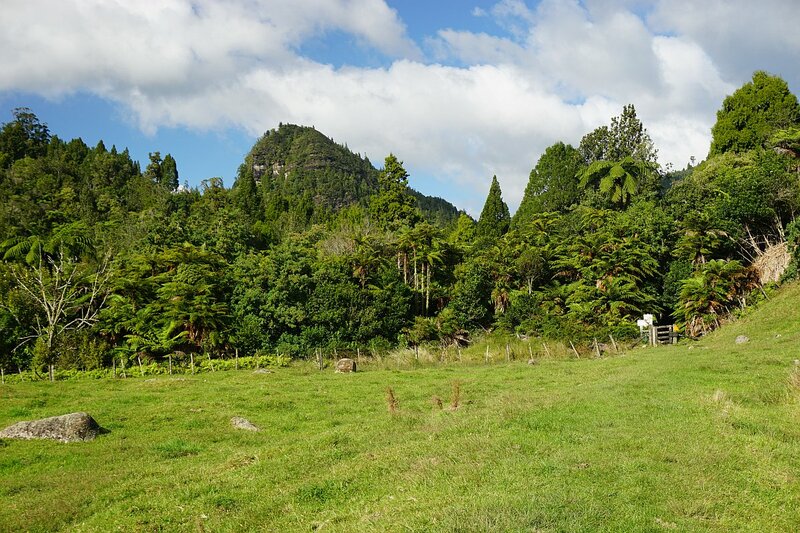 There are facilities for cleaning and disinfecting boots to stop the spread of Kauri dieback disease. Almost 2 km of the first part of the walk passes through farmland. The track follows the original tramway, although there are no longer any obvious signs of this. 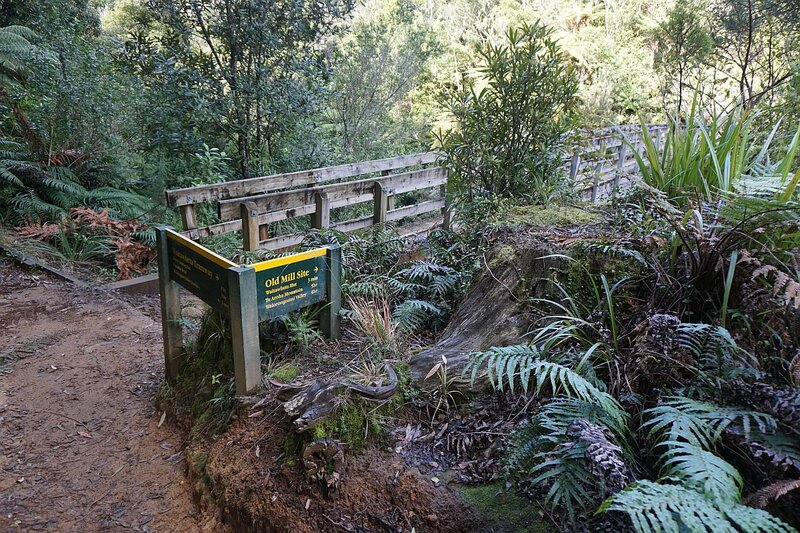 The entry point to the Kaimai-Mamaku Forest Park. 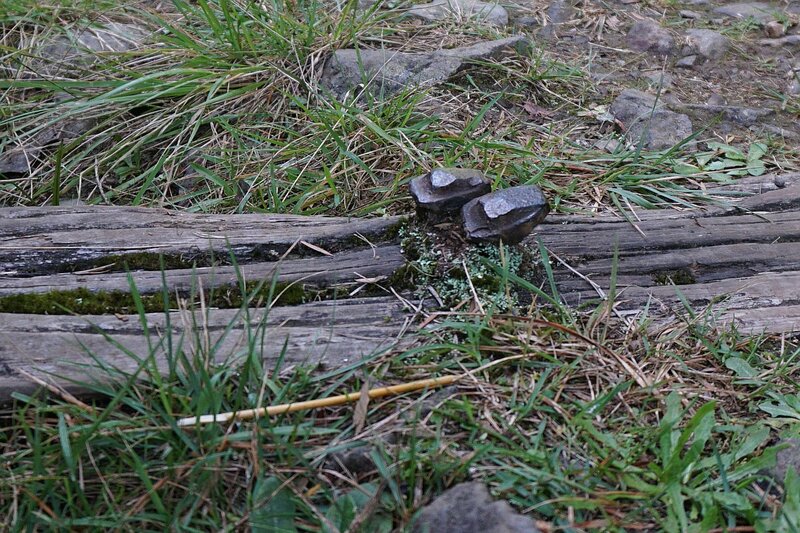 The tramway sleepers are still visible in many places along the track. 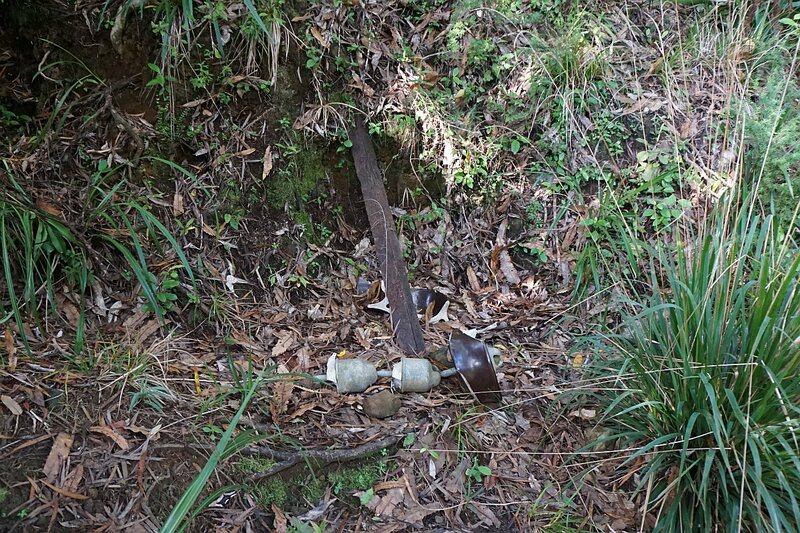 Many of the spikes used to hold the tracks are also still in place and in surprisingly good condition. 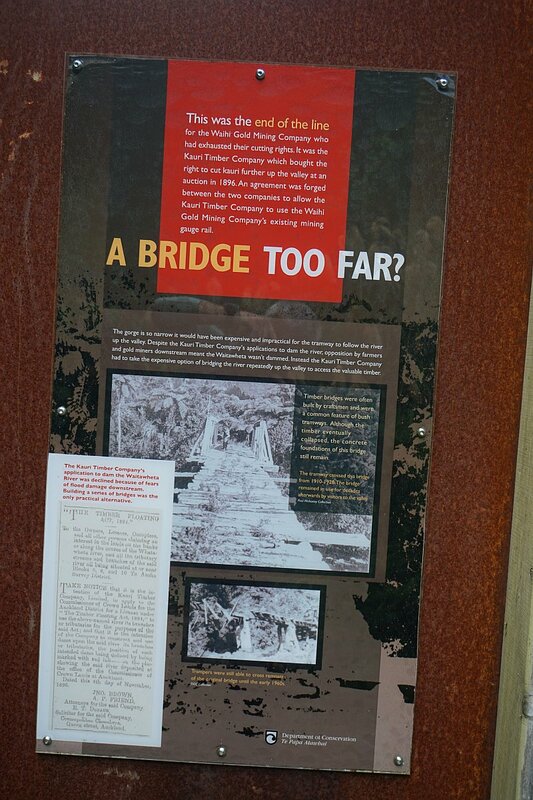 Information panels describing and depicting the the log extraction and tramway construction are found in various locations along the track. This one shows the dimensions of a board foot of timber. 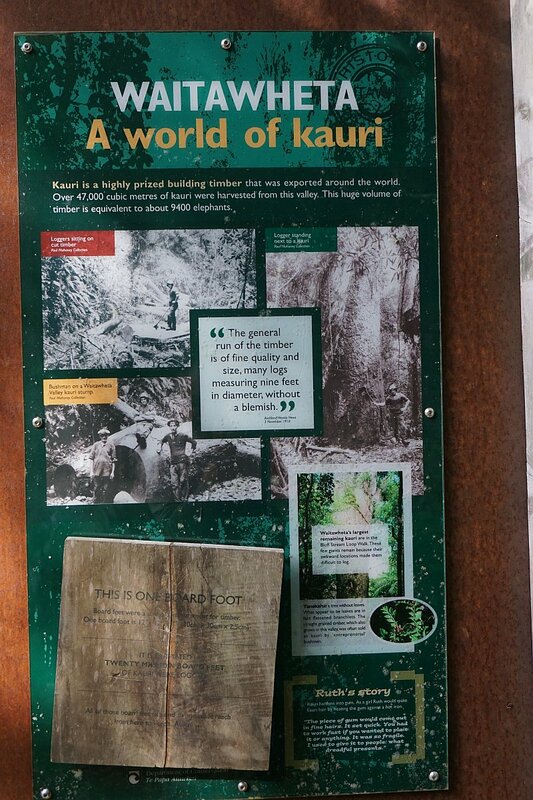 About 20 million board feet of kauri timber was extracted from the valley. 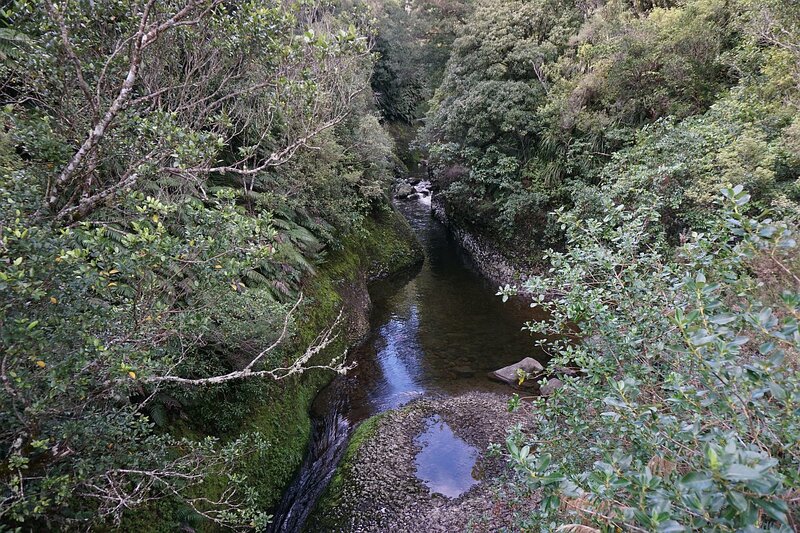 The tramway track follows the Waitawheta River through the valley and the gorge. The sharpest bend on the tramway is known as Devil’s Elbow. 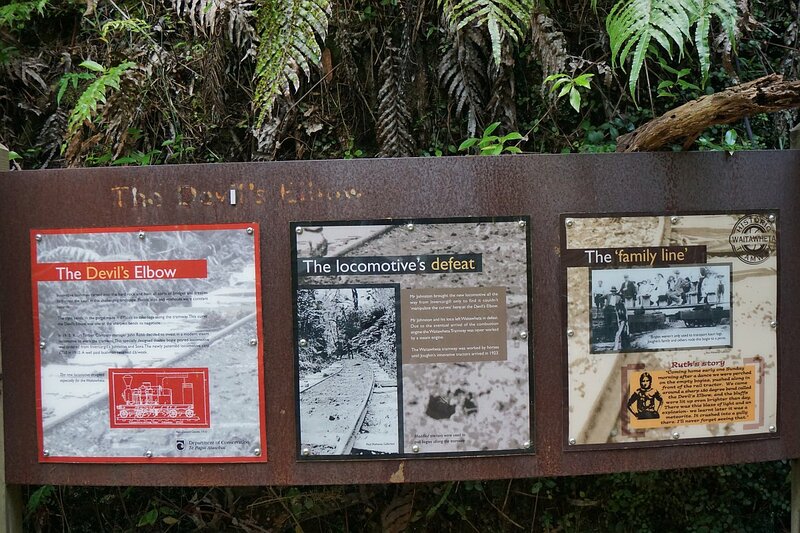 This information panel on Devil’s Elbow tells of the locomotive specially made for the tramway, but which turned out to be incapable of negotiating Devil’s Elbow. The tramway was worked by horses, until the arrival of tractors in 1923. 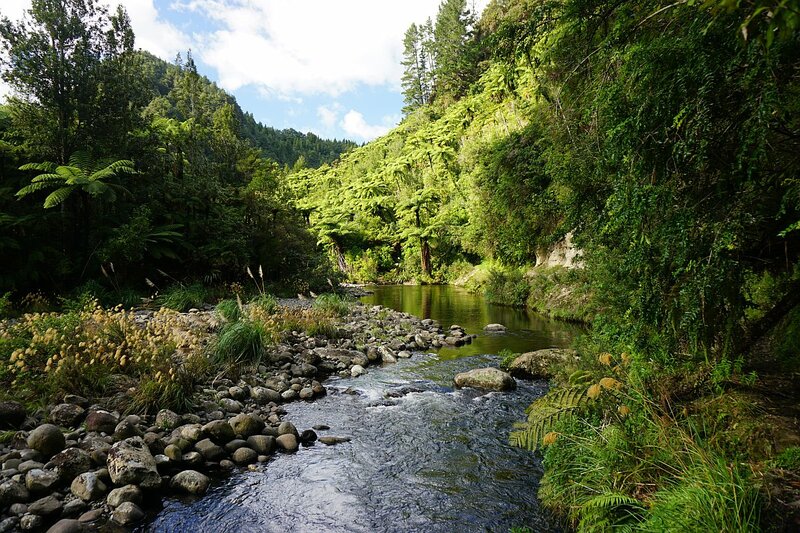 The Waihi Gold Mining Company extracted wood from the valley as far as the first crossing of the Waitawheta River. 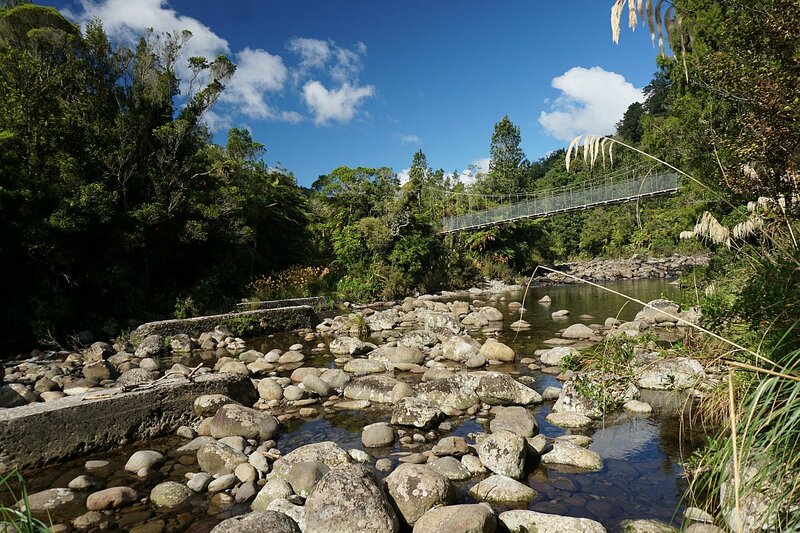 The purchaser of the rights to extract kauri logs then took over the tramway, and built the continuation with bridges over the river after an application to dam the river was denied. Damming the river would have allowed logs to be floated downriver when the dam was broken or opened. The concrete supports for the tramway are still found in the river, next to the newer swing bridge. Not far from the first river crossing there is a short length of reconstructed tramway, with a large log on a pair of bogies used for log extraction. The logs were placed on two bogies, allowing them to negotiate corners such as Devil’s Elbow more easily. 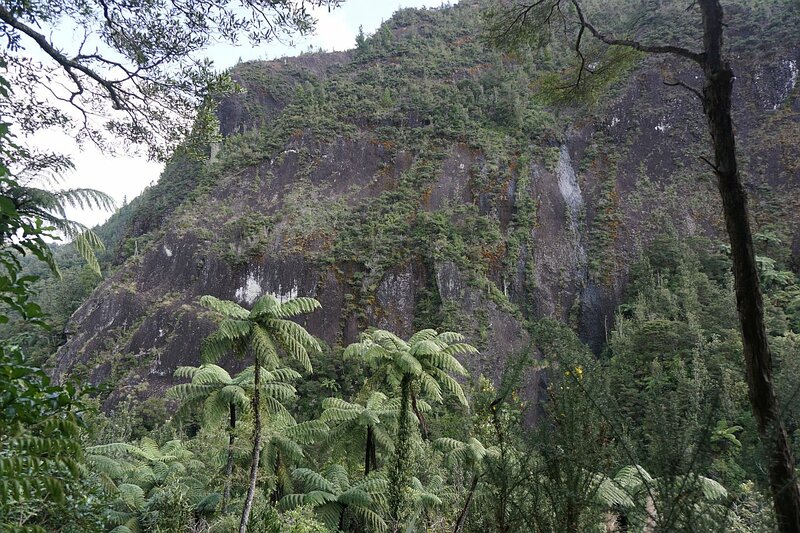 The Waitawheta Gorge has some very steep cliff faces alongside the river. A few cuttings were required to maintain the tramway’s gentle slope. The path of the tramway bridge can be seen clearly, with the new bridge constructed a short distance away at a narrower crossing point. 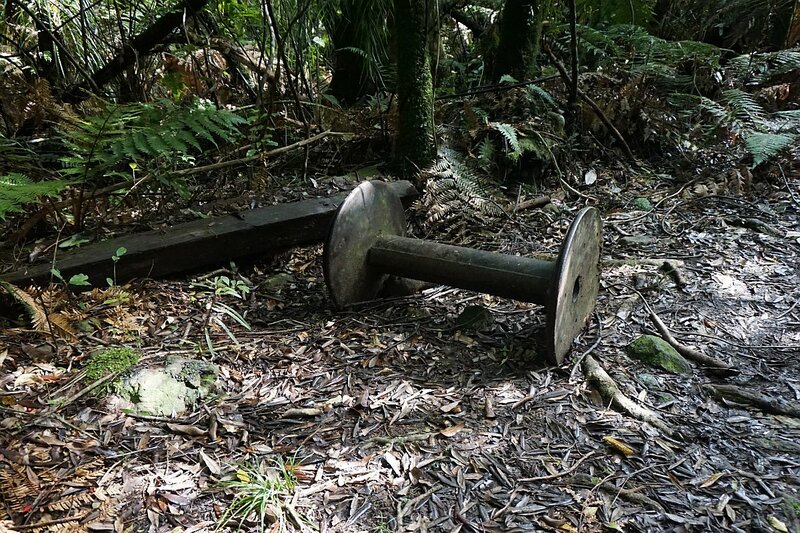 Remains of the tramway and equipment can be found at various places. About 100 m before the only unbridged river crossing a track branches off to the left, bypassing the river crossing and one of the bridges. 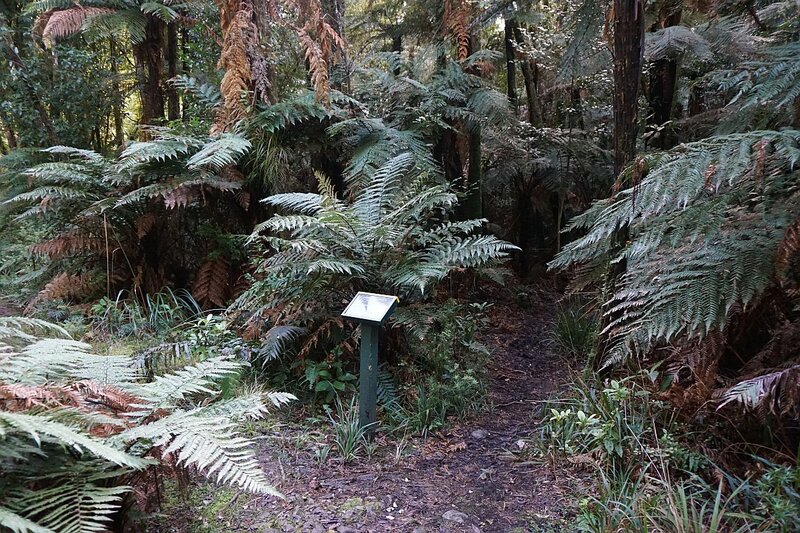 It is slightly longer, steeper and narrower than the river crossing route, but well marked and easy to walk. The bypass track joins up with the tramway again, and the tramway is followed from here to the mill site and hut. A short distance after joining the tramway is the intersection with the track leading to a bridge and the river crossing. This was the route followed on the return walk. 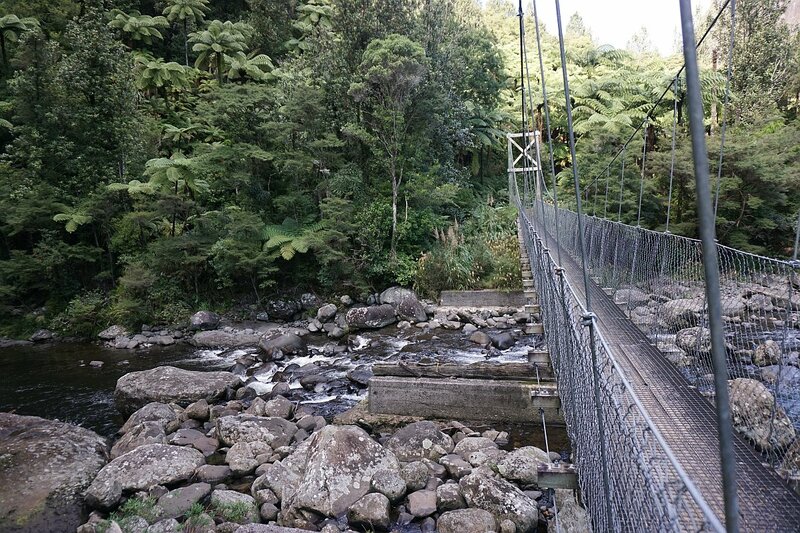 The bridge crosses over a narrow section of the Waitawheta River, leading to the mill site and the Waitawheta Hut. 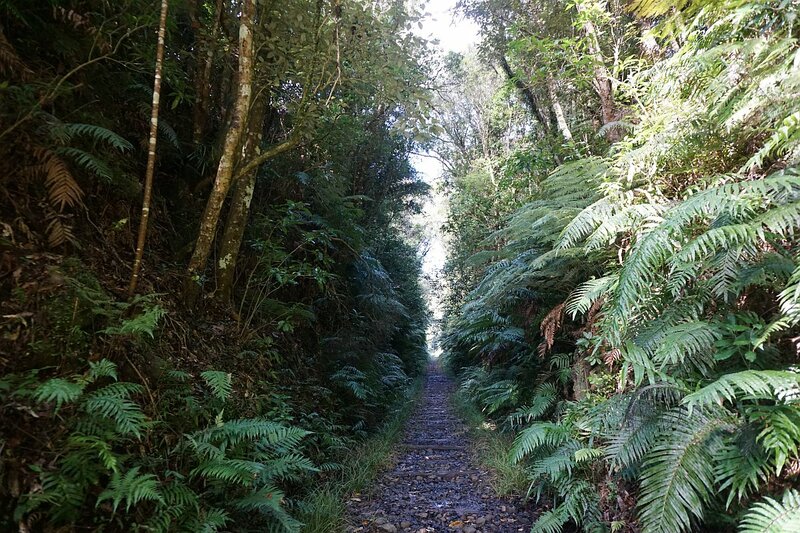 The tramway ends here, but the track continues off to the left, with a junction about 5 minutes further on with a track to Ananui Falls and Woodland Rd, and a track into the Wharawhara Valley. 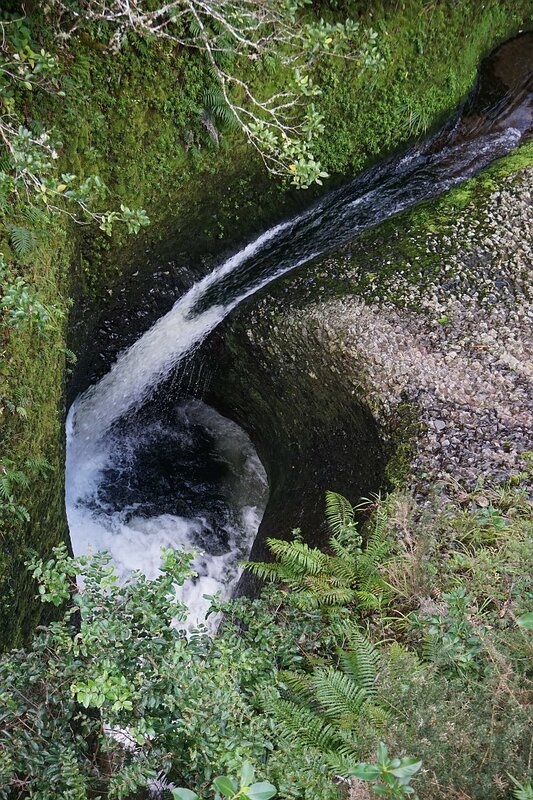 The toilet bowl waterfall by the bridge to the mill site and the hut. Looking upstream above the toilet bowl waterfall. 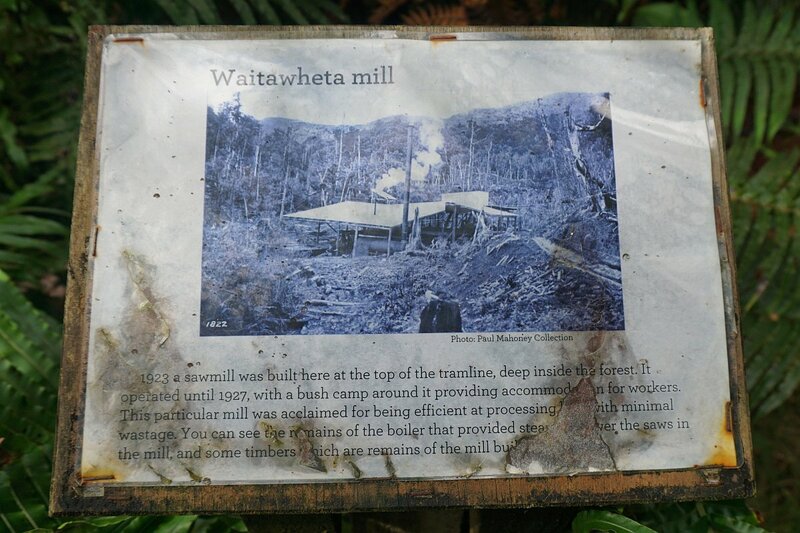 Unfortunately most of the information panels about the sawmill have disintegrated or disappeared. This was the only one still legible. 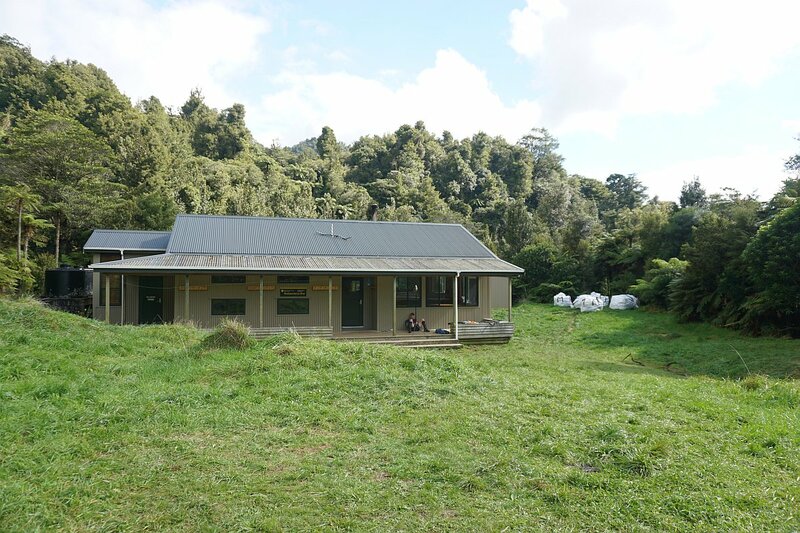 The Waitawheta Hut. 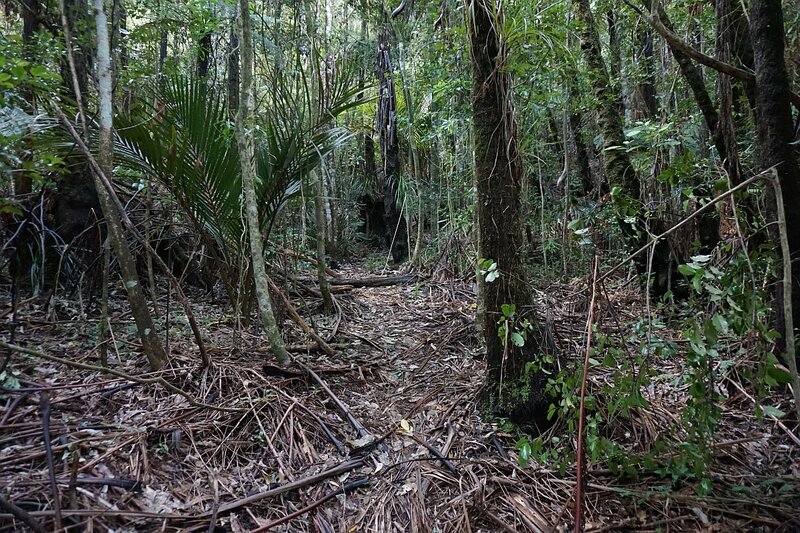 The Waipapa Track starts behind the hut, to the right. 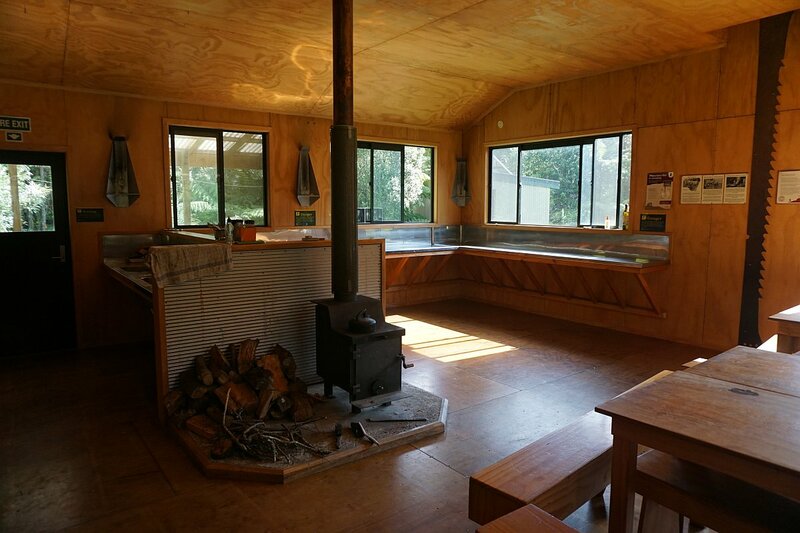 The main room in the hut, with heating and kitchen facilities. 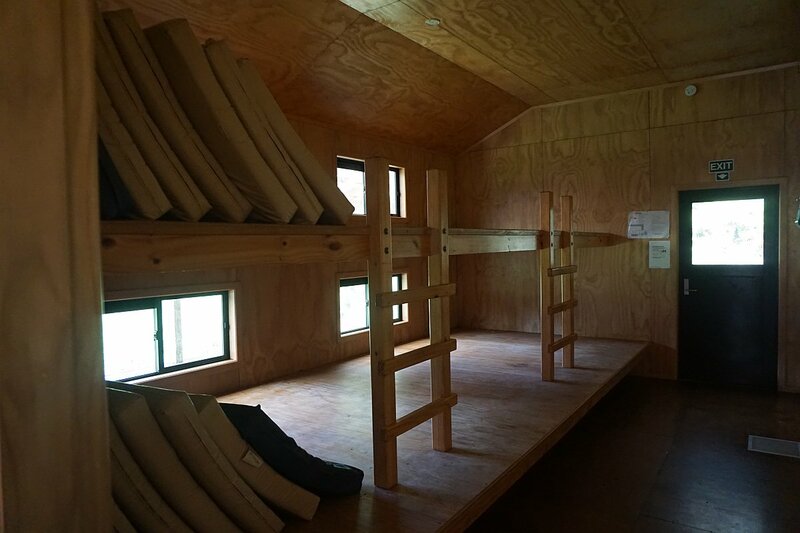 One of the two bunk rooms in the hut. Booking with DoC is required for overnight stays in the hut. On the return walk with the river crossing, there is a small clearing signposted as a camp site, near the crossing, with a basic DoC toilet. The river crossing. 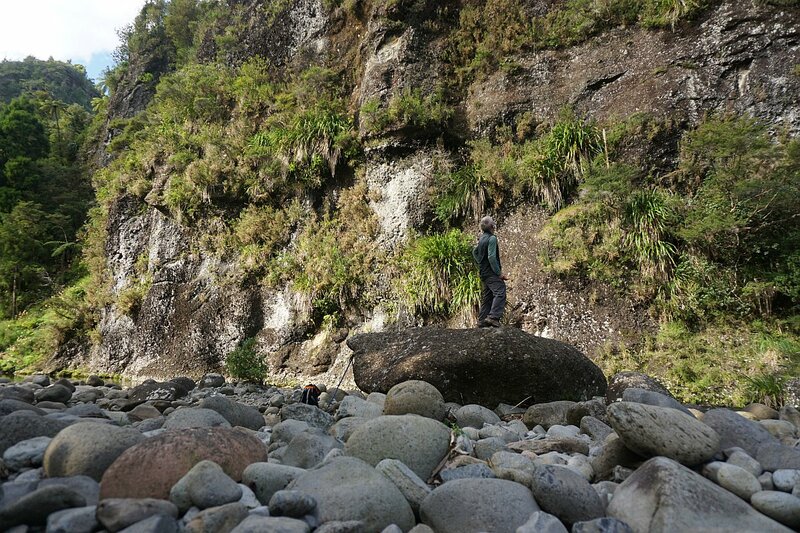 On this day, a few days after heavy rain in the area, it was possible to cross without getting boots wet by jumping from rock to rock. 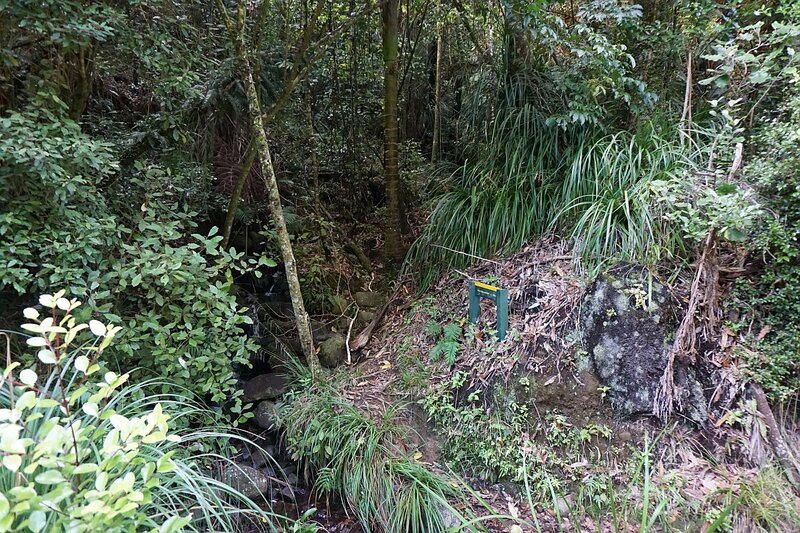 Near the log bogies there is a short detour track, with a small sign pointing the way, leading up to a pylon site from an old electric transmission line, presumably the one supplying Waihi gold mines from the first dam on the Waikato River at Horahora. There are no information panels about the pylon. The track is unmarked but easy enough to follow. Apparently the only remains of the pylon and an insulator. The steep bluffs across the river are clearly visible from the pylon site. 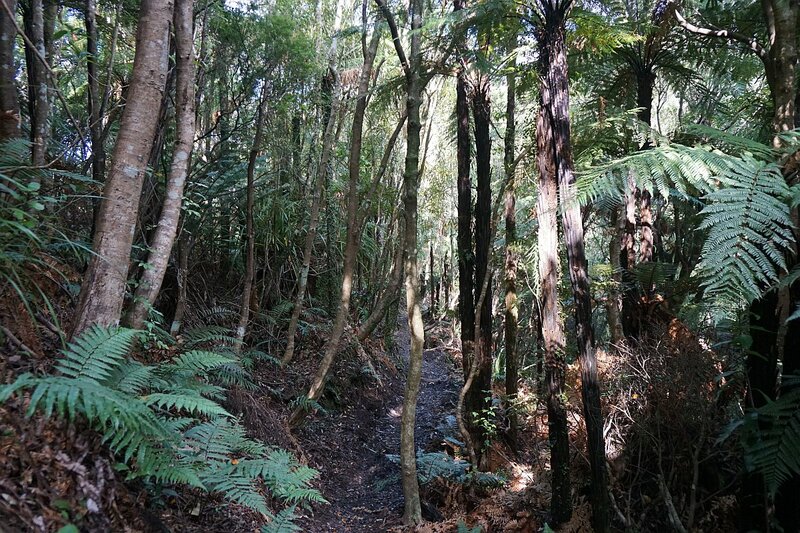 A suitable spot for a break on the return walk, by the start of the track to the Bluff Stream kauri. 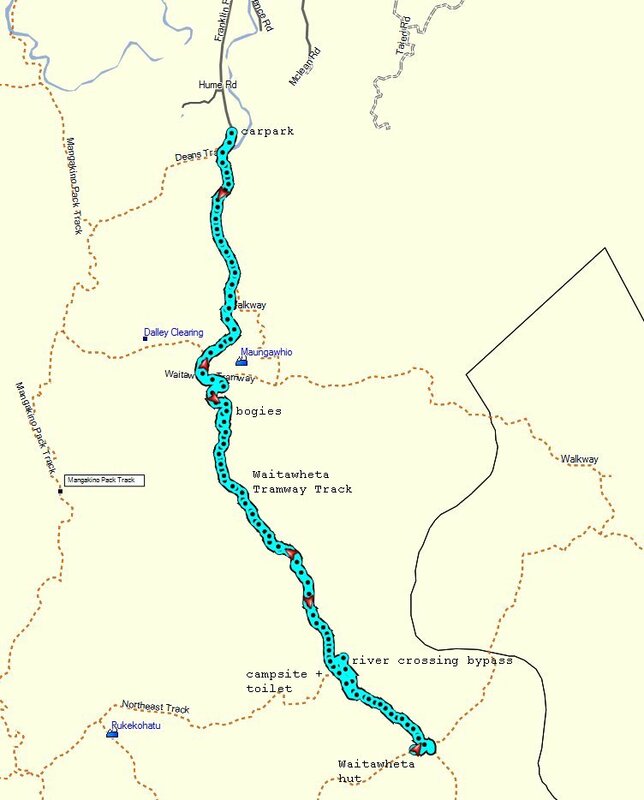 The GPS tracklog shows the route followed, from the carpark on Franklin Rd at the northern end, to the Waitawheta Hut at the southern end. The location of various landmarks along the way are also shown. Total time was 5 hours 30 minutes, including a lunch break and a break on the return walk. Total distance 19.7 km. 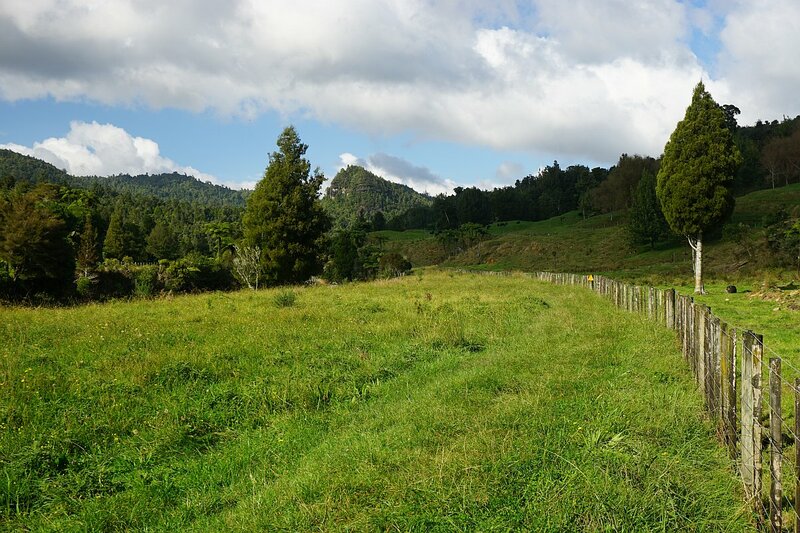 Elevation at Franklin Rd about 160 m asl, with Waitawheta Hut about 380 m asl. Franklin Rd to log bogies: 1 hour 10 minutes, 4.4 km. Franklin Rd to river crossing: 2 hours, 8 km. 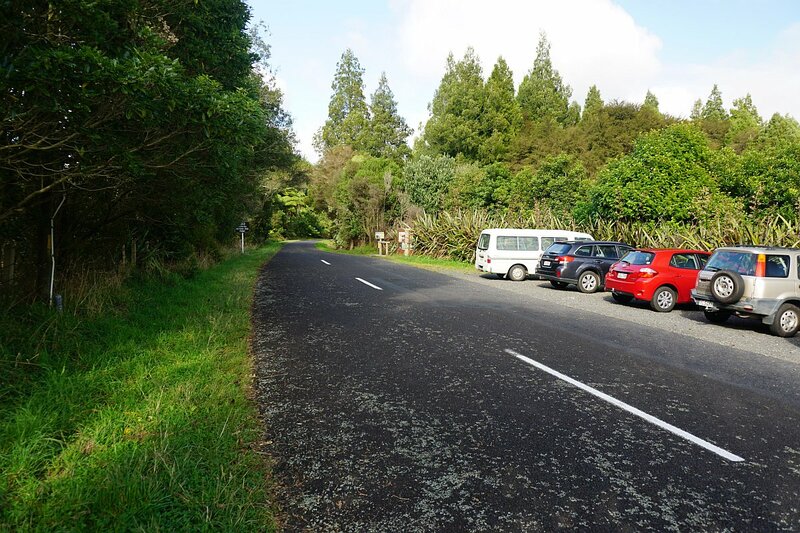 Franklin Rd to Waitawheta Hut via detour: 2 hours 35 minutes, 10 km. 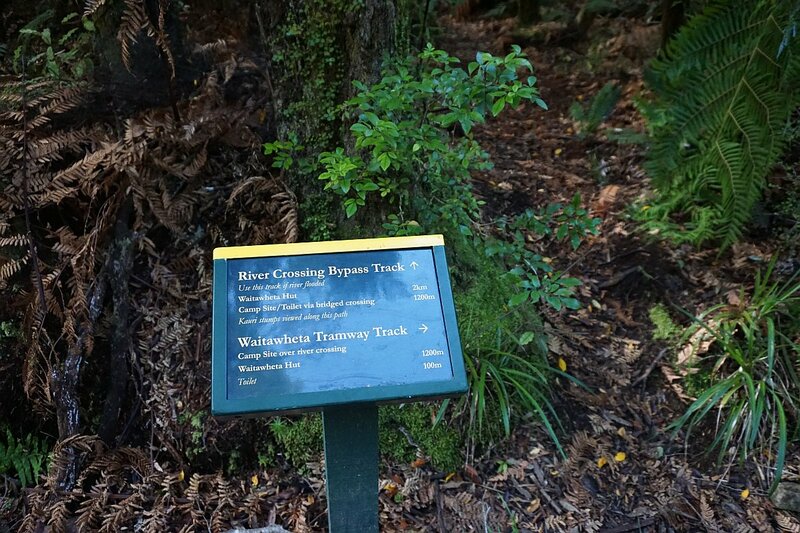 Waitawheta Hut to Franklin Rd via river crossing: 2 hours 10 minutes, 9.7 km. 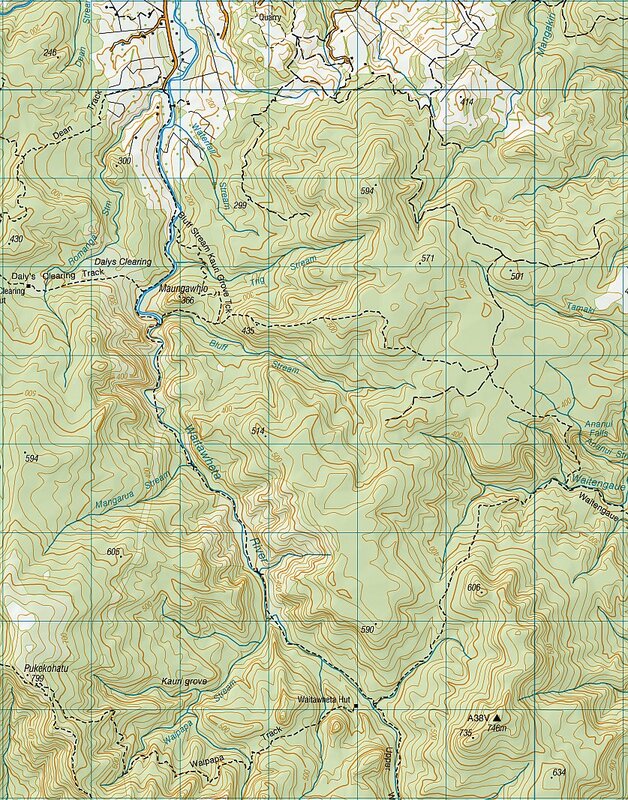 The topographic map shows the topography of the area and the track. The track was walked on April 20, 2016. 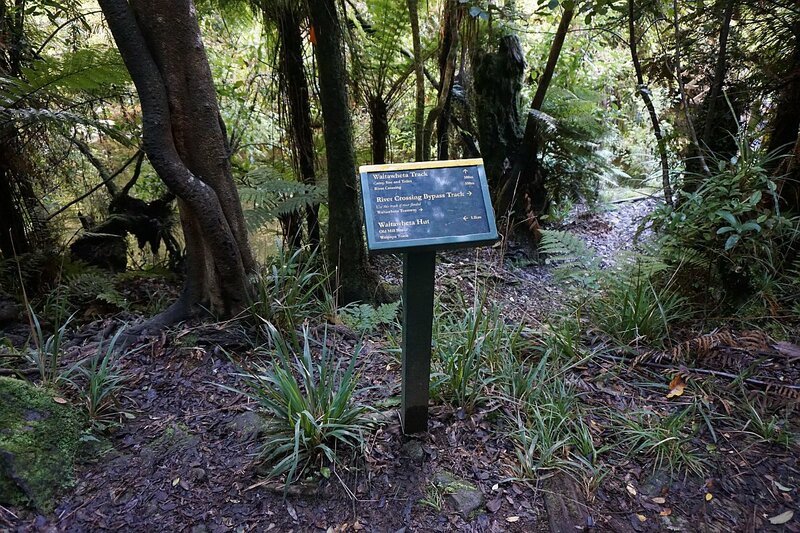 This entry was posted in Walks and tagged Kaimai Mamaku Forest Park, Kauri, Waitawheta, Waitawheta Hut, Waitawheta River, Waitawheta Tramway on 2016-04-21 by nzartig.